birthdays (how else could we fund our Barbie doll habit? ), and the chicken rice porridge that gave us sustenance when we lay sick in bed (or just feigned illness to stay home from school). In Asian cultures, the grandmother’s role is manifold, but one is of utmost importance: to ensure that grandchildren learn and preserve the many aspects of their ancestral culture. This is especially true in immigrant communities. As an Indonesian Chinese living my formative years in an adopted country, food was a very vital link to my culture and heritage. In my case, my mother was the missing link as my sole surviving grandmother lived in a different country. Hence, for me and many others, grandmothers, mothers, and aunts are all custodians of home-cooked traditions. More often than not, these women cook by instinct and their recipes are not recorded on paper. They hand down the secrets of the art of cooking verbally, and by example, from one generation to the next. By running around their knees or loitering at their elbows, generations of children and grandchildren have learned foodways and captured vivid memories of the how’s and why’s of cooking via osmosis—from the snap, crackle, and pop of spices roasting in the pan to the subtle balance of hot, sour, sweet, and salty on the tongue. These women link us to our heritage, particularly through food. Today, life has changed. Instead of popping over to Grandma’s place (she might even live on a different continent) or pulling out the wok to recreate our favorite family recipe, we head to any one of the Japanese restaurants down the block when we hanker for a savory sukiyaki. If we feel like a snack of crispy wontons, Chinatown beckons. Craving some pho (beef noodle soup)? Then we head for one of the vietnamese restaurants that are competing for storefront space with coffee shops and yet another Thai eatery. Just when did the restaurant become the keeper of our Asian food heritage? Perhaps the forced incarceration of Japanese Americans during World War II led subsequent generations of Asian Americans to distance themselves from their heritage. Maybe it was in the 1960s and ’70s, when mothers fed the work force instead of their children. Or perhaps it was when migration—whether voluntary or forced— splintered families, scattering them around the world. The phenomenon could be perpetuated by nuclear families splitting apart thanks to increasing divorce rates. We could also chalk it up to the inevitable watering-down of culture and heritage that comes with living in an adopted homeland over many generations. And who can blame refugee children for wanting to eat meatloaf instead of canh (vietnamese soup) in an effort to embrace all things American and develop a sense of belonging? Whatever the reason, modern times are making Asian home cooking a lost art in the United States, and many of the new generation of Asian Americans are now ignorant of these skills. That missing link to the past is a void that needs to be filled. For this cookbook, I have interviewed, cooked with, and connected with grandmothers, mothers, aunties, and numerous people who have generously contributed their time, recipes, and stories. These recipes are family favorites that have been passed from mother to daughter to granddaughter, adapted, interpreted, and improvised according to the availability of ingredients and evolving palates. Some of the recipes are not to be found in print anywhere else. I’ve also included little tidbits of culinary wisdom that only a grandma can impart after years of cooking, as well as special family stories connected to the recipes. Through research and a little detective work, I have also uncovered recipes from the annals of time that have been hiding in old church and community cookbooks. Often unattributed, but no less important, these recipes are also representative of our food heritage. The recipes meant a lot to the people who shared them and I want to record them before they disappear into the past forever. 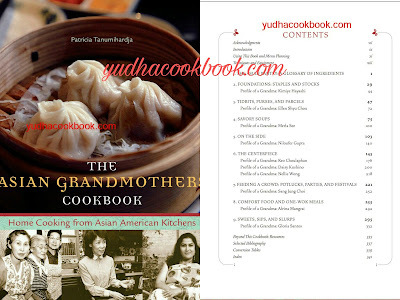 I have compiled family recipes and stories from Asian communities across the spectrum. you’ll find recipes from China, Japan, Korea, India, Pakistan, Nepal, Indonesia, Malaysia, Singapore, Laos, Cambodia, vietnam, and Thailand. Many of these recipes have evolved from their original incarnation several fold, such as Indian curry from Guyana, Chinese-style shrimp toast from vietnam, and a Dutch-influenced sweet (klappertaart) from Indonesia. Regardless of where in Asia they come from, these recipes represent a universal theme—they tell the story of our immigrant past. In lieu of a real, live, and kicking person, I hope this book by your side will be like spending the day cooking with your very own Asian grandmother.